Centric Inc is proud to stock our own hardened steel feed rollers. Centric brand steel feed rollers are made in the USA and case-hardened to a Rockwell hardness of 53-58 scale C. Centric steel feed rollers are designed to properly fit any Weinig, Diehl, and SCM moulders. At Centric we can offer both bolt on and shaft mount feed rollers to fit Weinig, Diehl, and SCM moulders. The Weinig style bolt on mount steel feed rollers have 3 through holes with a single pin hole. The Diehl style bolt on mount steel feed rollers have 2 through holes and 2 threaded holes. Our most popular shaft mount steel feed rollers for the Weinig, Diehl, and SCM moulders are our 35mm bore with 10mm key for the Weinig and SCM style and 30mm bore with 8mm keyway for Diehl style steel feed rollers. Weinig and SCM steel feed rollers that larger than 2” and Diehl steel feed rollers larger than 1 ¾” includes a window to allow users easy access to loosen and remove the feed roller with a wrench. The reason for the popularity of the window is that the alternative is an allen set screw that has a tendency to fill up with saw dust and debris; possibly making the removal of the feed roller difficult. I should note again that the only size steel feed roller that includes a window is Weinig and SCM 2” wide or larger and Diehl 1 ¾” wide or larger. Smaller shaft mount sizes are available with just the allen set screw. Typically you will see the shaft mount steel feed rollers at the beginning of the moulder feed in a wide array. Once the material is fed farther into the moulder, smaller width steel feed rollers are necessary to continue feeding the material through the moulder. The other mounting style steel feed rollers that Centric Inc offers is the bolt on mount. Weinig, Diehl, and SCM all have different bolt on patterns as mentioned at the beginning of this blog. A bolt on system allows users to ‘stack’ steel feed rollers to a desired width. Centric Hardened steel feed rollers comes in a standard saw tooth style. The saw tooth style of steel feed rollers allows Centric Inc to offer a re-sharpening service that will give you feed wheels a ‘like new’ finish. Coming soon in 2018 Centric Inc will be adding a new line of tooth style to our steel feed roller inventory. 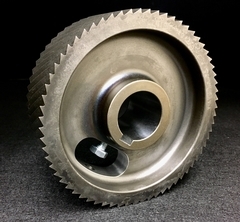 In 2018 Centric will stock an aggressive tooth style steel feed wheel. The aggressive tooth style is made for feeding wet timber for a number of applications. Centric Inc is currently taking orders for wet timber steel feed rollers and be sure to look for them in our 2018 catalog. Please feel free to contact us if you have any questions or are interested in a quote at 715-848-4242 or email us at info@centrictool.com. We look forward to servicing your tooling needs.